The internet has a weird fascination with torturing Furbies. Whether they’re being crushed, burned, or disemboweled, people never seem to grow tired of watching these once-cherished talking robots go through hell. 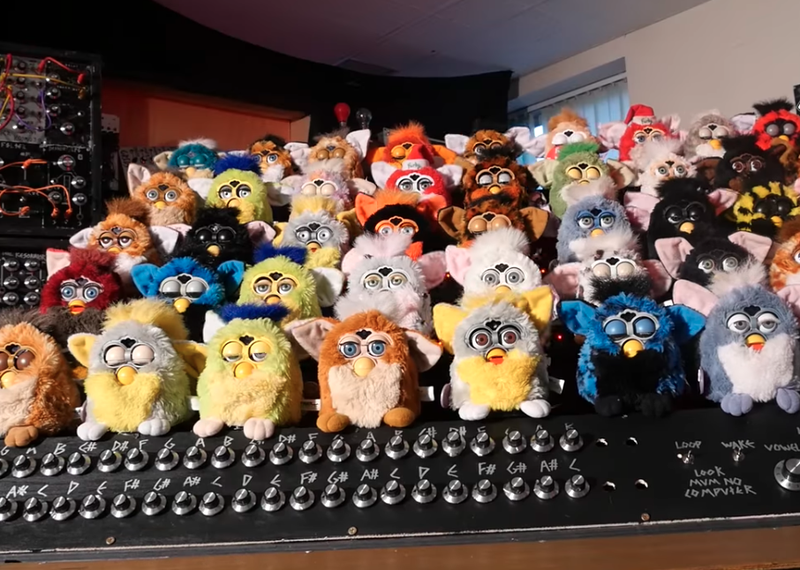 This latest and perhaps most involved installment of Furby mutilation brings us the Furby Organ, a chaotic jumble of wires and brutally hacked ‘90s nostalgia that’s here to scream in atonal agony for your enjoyment. Over a year in the making, the newly completed Furby Organ is the creation of YouTube mad scientist Look Mum No Computer host Sam, who looks right at home behind a synthesizer. It consists of 44 Furbies that have been rewired and hooked up to an electronic organ via the “Formant Furby Fusion Synthesis Brain Modification Surgery Procedure” so they can harmonize, chirp, and glitch out on command. “Each of the Furbies are also able to generate a formant vowel note,” says Sam, before demonstrating the warbling synth tones that can be played under a chorus of ceaselessly chattering toy robots. It’s not exactly easy listening, but it’s an impressive Frankenstein-like creation. While the Furbies belt out their nightmarish tune, we get a glimpse at the complex hardware behind the music. But if you’d like a more in-depth look at how the Furby Organ came to be, Look Mum No Computer previously posted a couple videos on the construction process. Though none of them end up burned or cut into pieces, their forced musical enslavement still makes this an impressive addition to the canon of Furby mutilation theater.